“Say What?” was published by Create Space in December of 2015 and is now available in paperback through Amazon. It is also in circulation at the Rossmoor Library and may be purchased for $10 directly from the author at wattsestelle193@gmail.com. This collection of poems is built around the themes: Remembrance, Reflections, Thoughts, Loss, Looking at My World, Looking at Nature, and Looking at Myself. 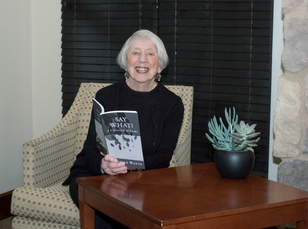 The book is dedicated to Watts’ late husband, Ron, who was an avid writer. He gave her a book on poetry and, after reading her work, encouraged her to continue and publish her poems. Estelle earned a BA degree at the University of Rochester/Eastman School of Music and is a graduate of UC Berkeley in Painting. Having received a teaching credential at Bank Street College, she taught for 30 years. She owned a small printing business in Montclair for 20 years. Watts moved from Healdsburg to Rossmoor a year-and-a-half ago, and enjoys working in the Rossmoor Ceramics Studio.